Steampunk and Alexander Calder... huh? I know - an odd combo, but miraculously, lovingly placed before me in a most appetizing way this week. I had no idea what "steampunk" was when my friend Jean Yates told me she had a necklace in the book, "Steampunk Style Jewelry: Victorian, Fantasy, and Mechanical Necklaces, Bracelets, and Earrings", by Jean Campbell, so I googled over to Wikipedia and found this: "Steampunk is a sub-genre of science fiction and speculative fiction, frequently featuring elements of fantasy, that came into prominence in the 1980s and early 1990s. The term denotes works set in an era or world where steam power is still widely used—usually the 19th century, and often Victorian era England—but with prominent elements of either science fiction or fantasy, such as fictional technological inventions like those found in the works of H. G. Wells and Jules Verne, or real technological developments like the computer occurring at an earlier date...". This turns out to be something I like.... a lot. The gears are turning madly in my brain, and steam is jetting out of my ears. 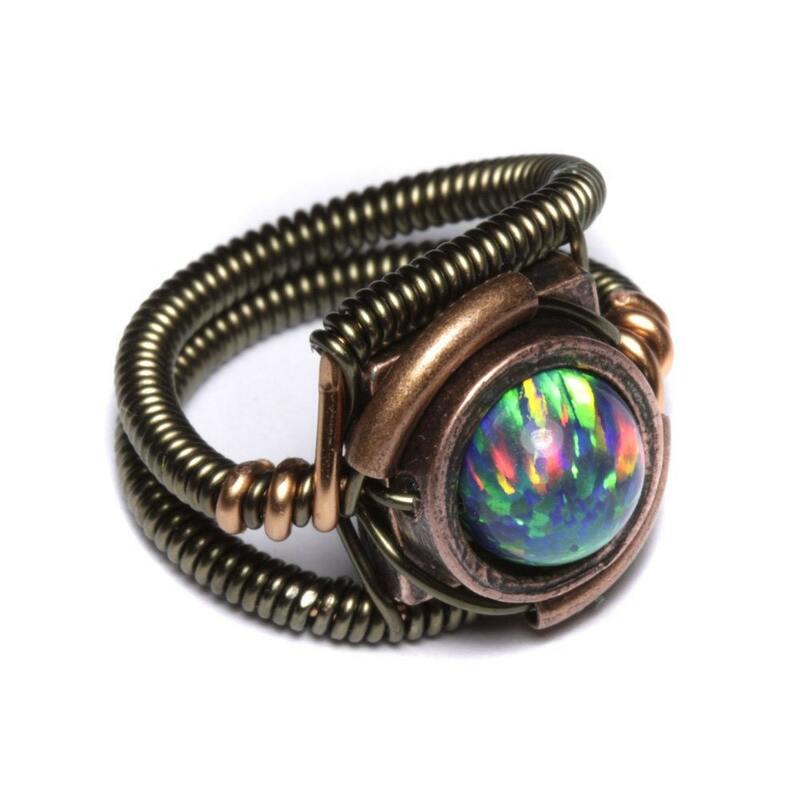 Oh, the things I want to make with beads and wire and other strange bits... after I buy one of Daniel's rings, of course... not to copy, no, no, no... but to give me courage and super powers. And as if this wasn't enough, Mitzi started talking about Alexander Calder, the guy most of us remember, at least subconsciously, as the artist who put mobiles on the map. He did a lot of other work too though. There were paintings and sculpture, as you might expect from a "real" artist, but what grabs my attention is his love of wire. Oh man... beautiful, humble, exquisite wire. He made wire sculpture and jewelry and even kitchen utensils for his wife because he wanted even the most functional items in life to be beautiful too. I am completely smitten. Connecting the dots, Mitzi and I are going "thrifting" in Yreka again today, in search of odd kitchen tools that need repair, love, and embellishment. That's Mitzi's project, and a worthy one I might take up myself. But my focus is still jewlery; personal adornment to empower the very spirit of the wearer. Where will all this manic inspiration lead? How should I know? My job is only to pay attention and follow along. Off to Yreka! The brand new issue of Step by Step Wire Jewelry issue has a great article by Connie Fox about her recent 'Calder' experience. Those lucky peeps in San Diego were able to see his exhibit. I want the Calder Jewelry book but it's $400!!! Guess I'll have to make a trip to the library. Ha--you have to tell me when I am in your fab blog! I love it!!!! I love Steampunk and Calder. Glad to hear that you love them too!